I think it was a first for me to get up at 5.30am on an Australia Day to drive for an hour to get to the start of a 6-hour race at the foot of the Blue Mountains, the Knapsack Lap Race of 5 km. It was quite a nice morning weather-wise to start with, but the longer it went the warmer and more humid it got. I decided to run without a watch or iPod and enjoyed the sound of the forest (and the distant highway) on my circles of 5 km. It was a kind of hilly course, and after about 3 hours and 5 laps, I started to slow down a bit. The check-point was well stocked with food and drinks and the cool Coke kept me going for another 3, slower rounds, however, with the sun almost straight on top, certain sections of the course got so hot and after 5.5 hours and 8 rounds I called it quits. It was a good 40 km training run for the Coastrek 2013. Sam did a great 6 rounds in 3 hours, and Denis, well, he is still somewhere on holiday probably with a Guinness in his hands. I am sure Mel is doing her running between the tennis matches down there at the Australian Open. For once I was quite glad to have a car, as it took me about 10 minutes on full aircon to cool down to be in a state to drive back to Sydney. For next week, we’ve planned a night training run to check out the trickier parts of the Coastrek. Happy feet and happy Australia Day! 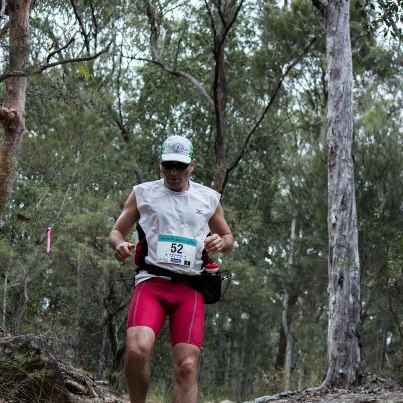 This entry was posted in Updates and tagged coastrek, sydney, trail running, training by run4vision. Bookmark the permalink.